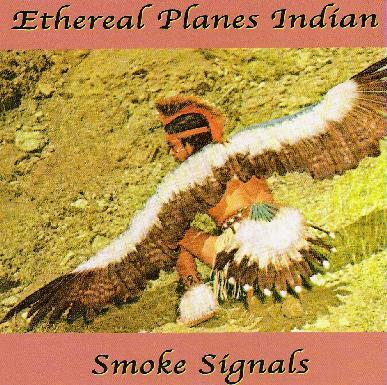 Ethereal Planes Indian - "Smoke Signals"
Some tracks I like, some I don't, but I suppose they will grow on me over time? I mean, I can handle bad sound, but not bad playing, what the f*** is a dude to do? However, this is what ya call experimentation, so anything goes. I find that there is creativeness moving its fingers over the CD, and for that reason I like it, but do not want to say that I love it because there a number of things that make me want to turn it off. For a pressed CD, it amazes me what people put out, to be honest and frank. I do not quite know how to term the music. It seems to me to be a mixture of loops/electronics, plus an array of live instruments overlaid in part. This part has a sort of electronic sound canvas/acoustic/bell type carry on, which I like for the reason that it is mellow and productive, progressive, and slightly surrealist. On the other side of the coin however, the bad guitar songs kill my face, and this troubles me greatly. In a nutshell, some of the songs are bad to me, but you can always skip them, which I did. I just guess his voice put me off! Now, after skipping the nasty stuff I find that we are back to the instrumental sound noodling with a Native American Indian flavor. This is the stuff that I like. It is weird, percussive in a Ghost Dance way, and littered with ambience. However, after this interlude we are back to the gravel voiced acoustic blues in a Lynyrd Skynyrd droning cack sort of way... enough said. The whole CD has an amateur Velvet Underground style, and the recording quality reminds me of them a lot. So does the playing, but sadly not the songs. Because as I say they are not my cup of tea at all. It seems to me that there are really two different genres melding in a separate kind of way. Meaning, do the blues-rock on a CD, and do the mellow ambient loop stuff on another CD. If I was honest, the two don't go together. I like the ambient stuff to a certain extent, but dislike the blues like shite. However, with this said, I also find that there is too much of a contrast between the two different genres to be palatable. I can hear Pink Floyd in the strange stuff. It does not offend the ear, but rather enchants it to listen. The only thing that I cannot understand is why it is spoiled with the bad guitar songs!